"Given the amount of time lag that's gone on between us doing the movies, I suspect that we might be very far away from, if ever, doing another DVD movie. This might be the closing of the book on that particular [chapter of the] franchise," said Shanks, who Sci Fi Wire interviewed recently. "Never say never. It's always a possibility. But I think everybody's moving on to a certain point, and with the new show doing well, everybody's focusing their attention on that. The SG-1 idea is somewhat in the back burner, which is a little bit unfortunate because I think one more story would have been a great way to bring Rick (Richard Dean Anderson) back in and really go there. But you know, business is business." Syfy's Stargate Universe, is the latest in the Stargate series, and will return to TV on April 2. 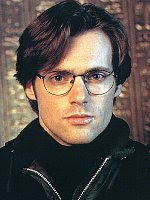 Dr. Daniel Jackson will also be guest-staring in two upcoming SG-U episodes.